Pietro Micca: tunnels and heroes | Where's Zoe now? According to TripAdvisor, the Museo Pietro Micca is the #11 thing to do in Turin. I saw that and thought, “Oh yeah, so what are things number 1 through 10?” but it turns out that #8 is “Spas” so I think we can safely ignore TripAdvisor’s rankings. At any rate, I think I’ve found my new favourite museum in town. The entrance is a bland-looking 1960s building you’d easily walk past, and the museum dedicated to the French seige of Turin in 1706, which sounds like a fairly specialized local history topic. But this seige involved clever engineering of underground tunnels, which were lost until building works in the 1950s uncovered them. Most of the network of tunnels is now uncovered, and a visit to the museum includes a tour of part of it. 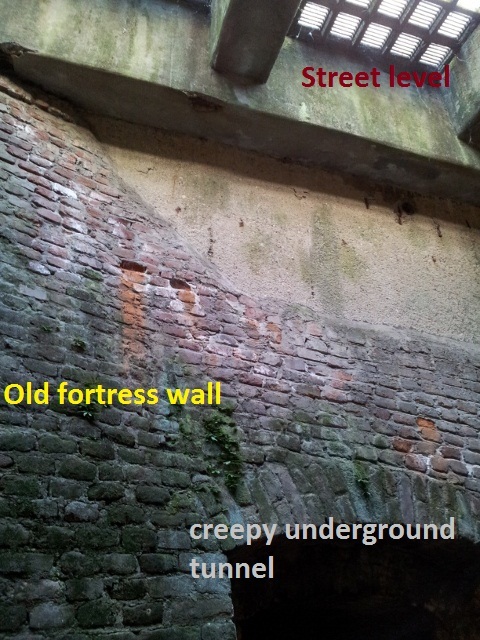 The idea of the tunnels was pretty smart — they radiated out from the Torinese fort and ran underneath the French forces. The Torinese then used the tunnels to place explosives under the French cannons, which were in banks of up to 10 and surrounded by high-ranking officers. Kaboom. “Pietro Micca traditional picture“. Licensed under Public Domain via Wikimedia Commons. Our guide, an older Piemontese gentleman, spoke slowly and softly, and had a rather dry sense of humour. “This painting is quite… interesting, for several reasons,” he said. “Also, look at his uniform. He is ready for parade! Would he really have all his buttons, so shiny like that? And from what we know, he was a short man, not so tall and handsome. “And the expression on his face — he is looking to his God as he prepares to sacrifice himself. But we know that wasn’t his intention. He had a wife and a young child. He wanted to get home to them. He was simply trying to stop the French soldiers, and he was killed because he didn’t get away from the explosion in time. “Ah, but look at the date on the painting — it’s from the 1850s. And now we understand. It was the time of Italian unification, and there was needed a national hero. And so, Pietro Micca,” with a northern Italian slight shrug of “what are you going to do?” and a gesture to the surrounding pictures of monuments to the Great Hero. Practical info for future reference: The museum is at via Guicciardini 7a, and is open Tues-Sun. Entry is 3 Euro (bargain!!!) and includes a tour (in Italian or English). More info, including tour times (in English). This entry was posted in Living in Turin and tagged museum, travel, tunnel, war on July 12, 2015 by Where's Zoe Now?. Turin looks fabulous, it’s never been one of those places on the typical Italian tourist trail I suppose but looks well worth a visit. Perhaps more so as it’s off the tourist trail! Love the post though, the guide sounded unique. Yes, Turin’s a great place to escape the tourist trail for a couple of days – though I guess that only works as long as not too many people decide to go there to avoid the crowds! Yep, the more it’s mentioned in blogs the more people will know about it. So shhhh.